This Weekend! Celebrate Armed Forces Day and Help Give a WWII or Korean War Veteran a Free Ride in an Historic 1939 Douglas DC-3 ! 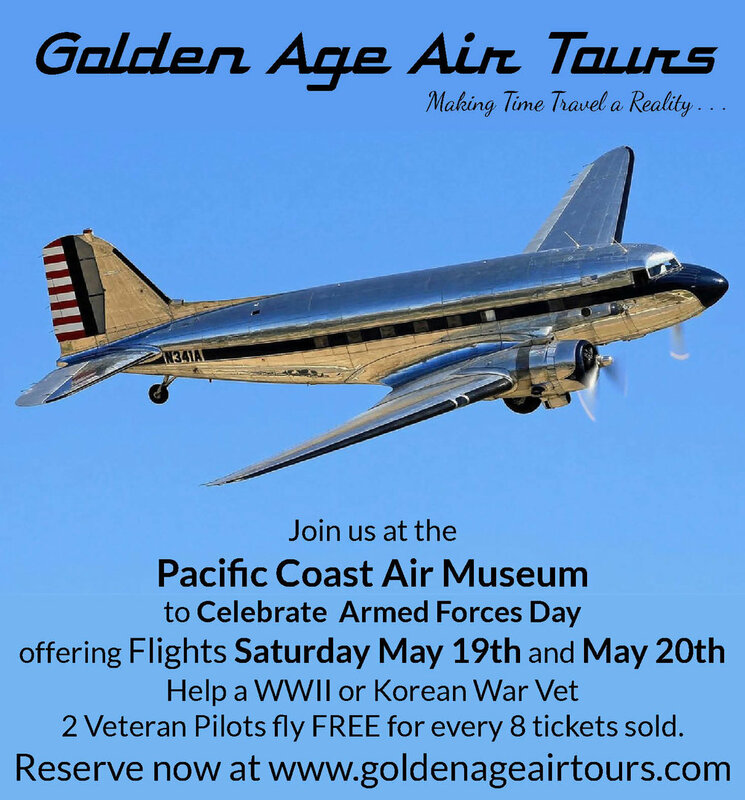 Golden Age Air Tours is offering scenic air tours in honor of Armed Forces Day and in conjunction with the Pacific Coast Air Museum “Celebrating the Living Historians” event at the Charles M. Schulz Sonoma County Airport on Saturday May 19th. and will also offer tours from the KaiserAir facility on Sunday May 20th. Take a tour in this unique piece of 'living history' that was requisitioned and flown by General Henry ‘Hap’ Arnold during the war years, and help a WWII or Korean War Veteran Pilot get a chance to travel back in time. FOR EVERY EIGHT TICKETS SOLD. Why not enjoy a truly memorable flight in this majestic aircraft while helping some of our few remaining ‘Greatest Generation’ celebrate Armed Forces Day in style!